Advantech WebAccess, as the core of Advantech’s IoT solution, provides users with a cross-platform, cross-browser data access experience and a user interface based on HTML5 technology. With WebAccess, users can build an information management platform and improve the effectiveness of vertical markets’ development and management. 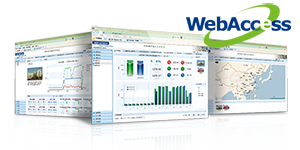 Advantech WebAccess provides an HTML5 based Dashboard as the next generation of WebAccess HMI. System integrators can use Dashboard Editor to create the customized information page by using analysis charts and diagrams which are called widgets. After the dashboard screens have been created, end user can view the data by Dashboard Viewer with any browser for a seamless viewing experience across PCs, Macs, tablets and smartphones.